I quite like the idea of sea-lioning as an activity. I understand the ambiguity and it reminds me of the drama CyberBully I watched recently which played on just this ambiguity. You talk about: Be more tolerant, don’t be so sensitive and you can always ignore the sea lion. These are useful strategies and yet what we are not foregrounding here is the emotional toll for those on the receiving end of ‘sea-lioning’. 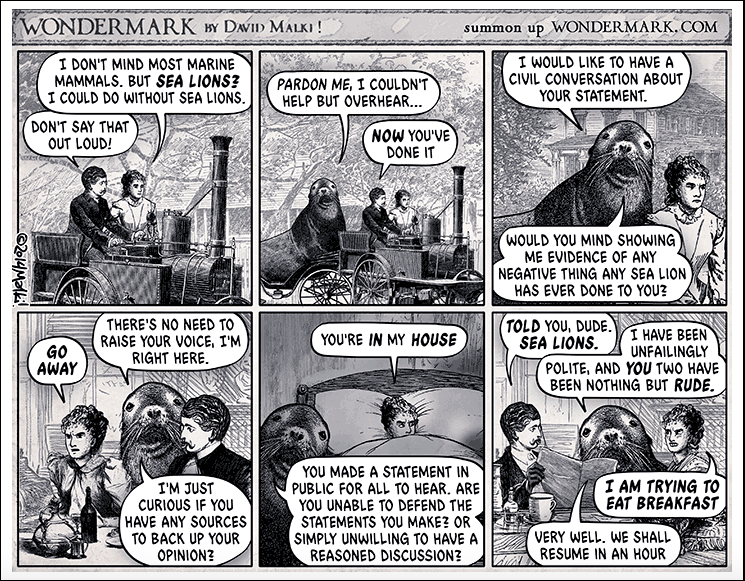 Yes, the sea lion may have good intent and may only be trying to be included in a conversation – I see that. Yet, at what point do we get to exercise our freedom to associate with people we choose? What interests me about the strategies you outline, and they are the only ones available to us publicly online, is that there is no choice to sea-lion the sea lion. If the only consequence to their behaviour is silence (and silence that cannot easily be interpreted by the sea lion) then how do we ever establish norms of interaction where all parties can be respected and heard? When I block somebody they may be silenced in my world, but I am also silenced in theirs. It saddens me that we cannot find a option to enable us to say in the public arena that is Twitter: I am uncomfortable with your behaviour, can we find other ways of talking to each other? Mostly, when this happens to me I just connect with my inner brat and want to say in a loud voice: i wan’t talking to you! Thanks for responding Mariana. I was really just thinking out loud about the very difficult business of public communication. You are right about its complexity. In framing some personal heuristics, I was putting the onus on the personal acknowledging myself as doer and done by because there are two behaviours that are very difficult for me to deal with. The first is (rare in my experience) the person who is determined to damage another person and will use anonymity or anything else to do so. The second is when someone has a one-dimensional view of conflict and seems only able to conceive of themselves as a victim rather than a (possibly unintentional) perpetrator of damage to another. I think I would be happier with an online culture where we expected and planned for misunderstanding and were ready to resolve it. Anyway, off I go to respond to your lovely post. Yes, I like how you express it ‘one-dimensional’ view of conflict where we can conceive of ourselves only as the victim and fail to see how our own behaviour can be construed as sea-lioning… Only after reading your comment I remembered that post I wrote for DS106 at York College ‘Your stalker, my friend’ (http://bit.ly/1Jmv06x) where I considered some of this issues and used the Terrible Sea Lion cartoon for the first time. I do see how our inability to find ways of interacting in these situations beyond ‘you are blocked’ leaves us feeling like Brianna Wu’s vending machine – the light inside is broken but I am still working. (http://imgur.com/9FPR1Vw) We can do better, I have to believe.